Shrimp Zoodles (aka zucchini noodles) with artichokes, sundried tomatoes and a sprinkling of pine nuts and feta cheese is ready in under 30 minutes. It’s also low-carb, gluten-free and sooo tasty. 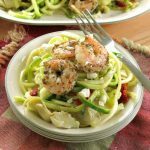 In case you ever wonder how recipes end up on The Dinner-Mom…here’s the evolution of this Shrimp Zoodles Recipe…which just might inspire your own creation. The Mediterranean inspired flavor combination of zucchini, artichokes and tomatoes topped with feta cheese is popular with our readers and at our house. Mediterranean Chicken Bake uses these ingredients with balsamic vinaigrette drizzled over the top. It’s delightful! I guess this is the starting point. What would be a quick and easy variation of this recipe? Hmmmm. Make zucchini noodles They’re just plain fun and cook quickly on the stove-top! We make them all the time for Zucchini Noodle Alfredo and Crustless Zucchini Pie. In fact, they can be made ahead of time! Time saver! Shrimp complements these ingredients and cooks quickly on the stove-top too so everything can be prepared in just one pan. Score! I happen to have sundried tomatoes on hand which would give a nice punch of flavor. Toppings? Toasted pine nuts would perfectly finish Shimp Zoodles. Don’t forget the feta cheese! It takes longer to think about the process then it does to make it! 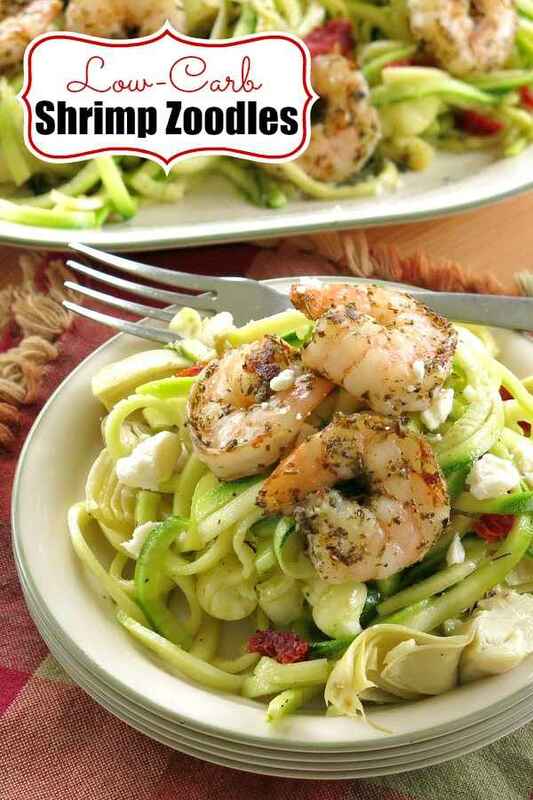 How to Make Shrimp Zoodles – Helpful Tips! Spiralize 2 large zucchini. The exact amount is not critical. And, if you’re not into the spiralizing craze, then thinly slice the zucchini. A hand-held spiralizer, using the thick cut, is perfect for the job. Don’t bother to peel the zucchini first. Instead, pick out some of the dark green pieces when you’re done spiralizing, if necessary. 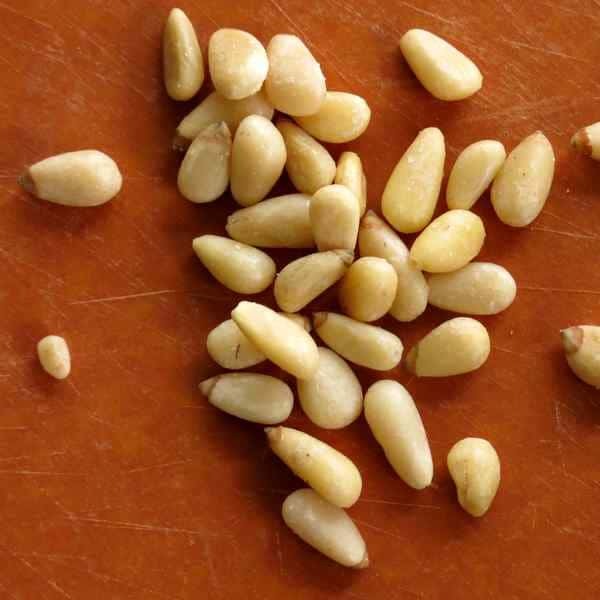 Pine nuts take on a buttery flavor when they are browned. Bake 10 minutes in a 350 degree oven or in a pan on the stove-top. Honestly, I feel like a sprinkling of nuts makes anything just a little more interesting and gives it a healthy boost too. If you have extras, check out Meatloaf Muffins which uses them too. Add artichokes and sundried tomatoes to the pan with the zoodles. When the artichokes are warmed, remove everything to a serving dish. Toss shrimp with olive oil and Italian Seasoning and cook in the same pan as the zoodles. We love this technique for pan frying shrimp and use it all the time! For a spicy version, check out Spicy Shrimp and “Cauliflower Grits. Simply pour the shrimp into the same skillet and arrange them in a single layer. Cook for about 3 minutes on one side and then flip to the other until the shrimp are bright pink and cooked through. Do this in batches if using a small pan. Please rate this Shrimp Zoodles recipe below and tag @DinnerMom on social media. We love to see what you are cooking up! Shrimp Zoodles with artichokes, sundried tomatoes and pine nuts are ready in under 30 minutes. Toast pine nuts in a 350 degree oven for about 10 minutes or place them in a large skillet and cook over medium high heat for about 10 minutes. Watch nuts carefully and stir after 5 minutes of cook time. Toss shrimp with 2 Tablespoons olive oil and sprinkle with Italian Seasoning, turning shrimp as you sprinkle so all sides are coated. Set aside. 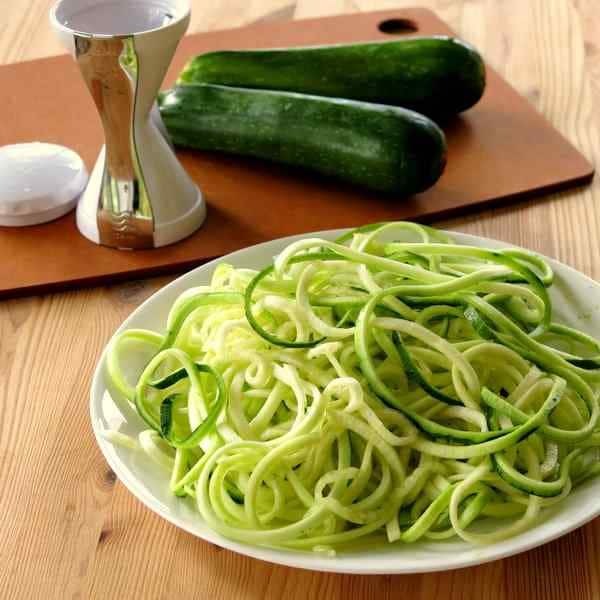 Spiralize zucchini into long strands or thinly slice it. Coat the bottom of a large skillet with 1 Tablespoon of olive oil. Add zucchini and cook over medium heat for about 5 minutes or until zucchini is tender. Add artichokes and sundried tomatoes to the pan and cook for about 2 minutes more or until heated through. Remove zucchini mixture to a serving dish. Cook shrimp over medium-high heat for about 3 minutes and then flip shrimp to the other side. Cook shrimp for about 3 minutes more or until shrimp is cooked through and bright pink. 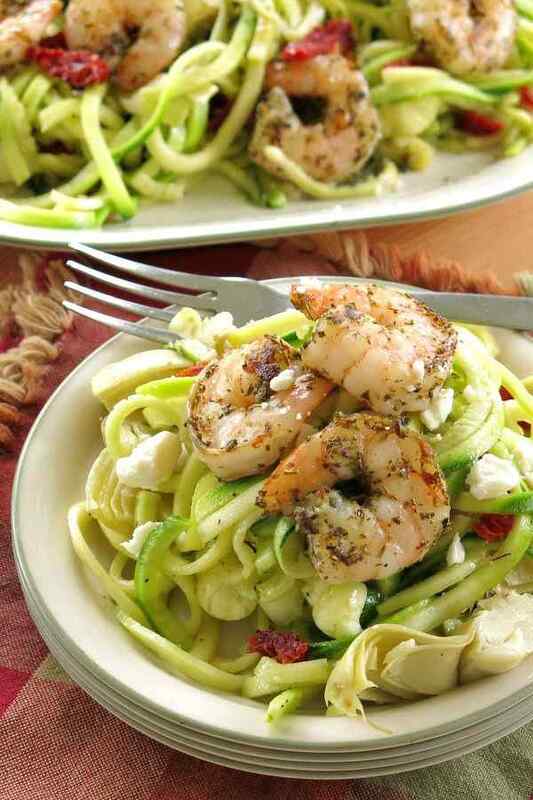 Serve shrimp over zucchini noodles. Top with nuts and feta cheese. This looks delicious and love that it’s so quick to make; perfect for a busy weeknight. I really need to get myself a Spiralizer; it looks so fun!! I love zoodles and pairing it with shrimp makes this a light and fresh dish. Looks perfect! I love shrimp! This is a great idea for those who want an alternative to pasta and is so quick and easy! Healthy, delicious meal with the zoodles (luv the name of that!). I could eat this any night for dinner or lunch! Those zoodles look so good. Pine nuts are the best and we use to pick them in the lower mountains when we lived in Palm Springs. That hand-held spiralizer looks great too. I seriously need to jump on this zoodle bandwagon! I loooove shrimp so know I would love this! I love it! I think I need a spiralizer! I usually just make “zoodles” with my food processor. Love you shrimp sauce too! Loving the flavors you put together here! A perfect meal after a long day of work. I have always wanted to try zoodles. This is totally for me! The flavors go together perfectly. I’m on a low-carb diet and this is one meal I could eat every single night and be satisfied. I make the zoodles in advance so it literally takes 15 minutes to make this recipe. Great make ahead tip! Thanks for sharing!